Yingke is proud to announce that we have recently signed a cooperation agreement with DFDL Legal and Tax, a full-service, international law firm with offices across Southeast Asia and Bangladesh. 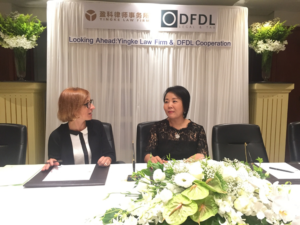 DFDL has officially joined the Yingke Global Legal Alliance and will now be a non-exclusive partner of Yingke in Southeast Asia and Bangladesh. Yingke now has partners in 100 cities spanning 51 countries and has developed a truly international presence across the globe. DFDL was formed in Vientiane, Lao P.D.R. in 1994 by four founding partners. 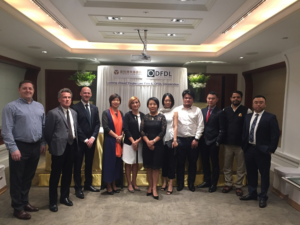 Since then, DFDL opened additional offices in the Mekong region to advise on pioneering transactions across the various emerging markets of Southeast Asia and beyond. DFDL was founded with the unique vision to be the first leading international law firm specialized in emerging markets with pan-regional legal and tax expertise throughout the Mekong Region, and now, Southeast Asia, South Asia, to the Middle East, and beyond. DFDL specializes in the following areas: banking and finance, corporate and commercial, employment, energy, mining and infrastructure, mergers and acquisitions, real estate, and taxation. DFDL has about 140 legal consultants and 300 support staff spanning the following nine countries: Bangladesh, Cambodia, Indonesia, Lao P.D.R., Myanmar, the Philippines, Singapore, Thailand, and Vietnam. DFDL has been constantly commended for the outstanding legal services it has provided since its inception in 1994. Most recently, DFDL has been awarded the International Finance Law Review Asia Award for both 2015 and 2017. The Firm consistently ranks highly in Legal 500, Chambers and Partners, IFLR 1000, and Asia Law Profiles. Yingke is keen to be at the forefront of China’s One Belt One Road initiative and assist Chinese companies in their aspirations to expand into different regions and sectors. Yingke has developed a deep interest in Southeast Asia given its geographical proximity, cultural comparability, open business environment and numerous investment opportunities in many different sectors, as well as relatively low labor costs. The Association of Southeast Asian Nations (“ASEAN”) officially established the ASEAN Economic Community heralding a new era of economic prosperity in Southeast Asia and further afield. The establishment of the ASEAN Economic Community presents excellent opportunities for Chinese companies to further increase their footprint in the region while building long-lasting partnerships in a region that China has historically flourished in. Furthermore, China is developing the Maritime Silk Road which will pass through the maritime interests of ASEAN nations. The Maritime Silk Road will increase collaboration between China and Southeast Asians countries and Yingke aims to be at the vanguard providing legal services across the region. This partnership is just another phase in Yingke’s strategy to further its international reach and be at the center of the development of trade and investment between China and Southeast Asia. Yingke was one of the founding members of the Chinas Go Abroad Alliance which aims to strengthen the competitiveness of Chinese companies aiming to procure their services abroad. Yingke also established Yingke Global Board of Directors, Yingke Global Advisory Board, Yingke Overseas China Center, and Yingke Global Legal Alliance as platforms to ensure Yingke plays a significant role in the provision of international legal services. Yingke was also part of the founding alliance that led to the creation of a global think tank in partnership with the United Nations Office for South-South Cooperation (UNOSSC). We are very delighted to have formed this partnership with DFDL and we hope both firms can work together to ensure our relationship continues to blossom and both parties further prosper from the vast opportunities that are present in the region and further afield.